Above are pictures of three finished dishes using the same piece of pork loin. When I shop for a center cut boneless pork loin I look for one that weighs around 3 pounds. They normally come with a layer of fat on the top, this one was trimmed fairly well. I did have to trim a little of what’s called silver skin off because it’s tough and you really can’t eat it. Other than that, it was a beautiful cut of meat. I knew Steve and I wouldn’t be able to eat all of the pork so my plan was to make it into 3 completely different dishes from the same 3-pound piece of pork. I made a spice rub using ground fennel, garlic, rosemary and lemon zest for the outside of the pork loin. After searing off all sides of the pork, I transferred the pan to the oven to finish cooking. 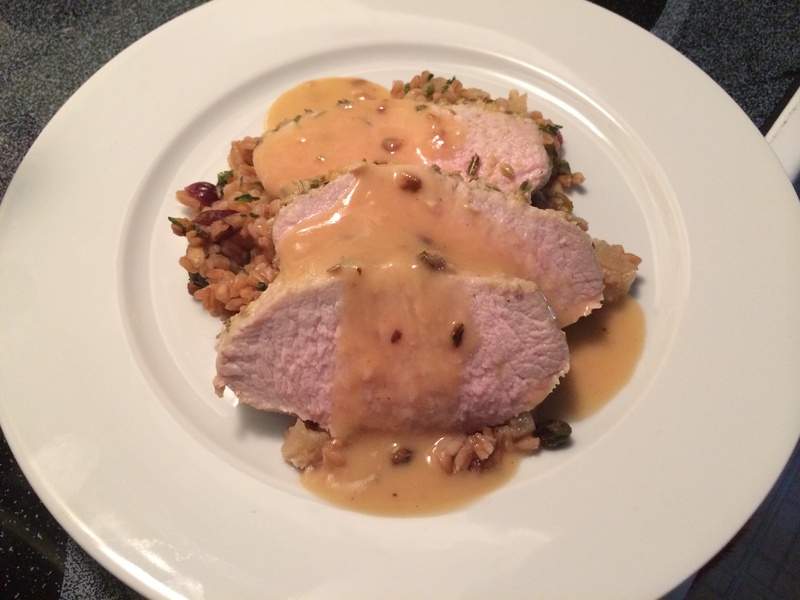 I served the pan roasted pork over a cranberry and pineapple farro drizzled with a delicious pork gravy made with the drippings from the pan. 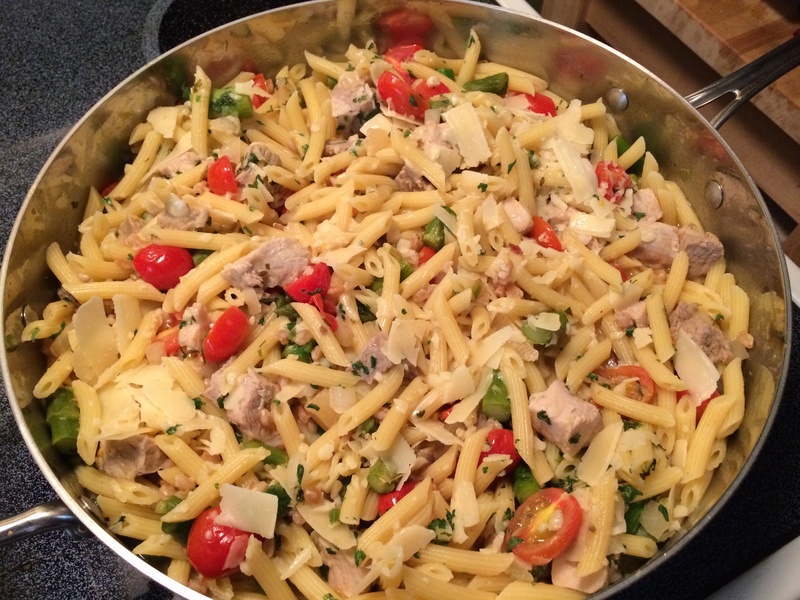 The second day I made a pasta dish that included the leftover roasted pork, tomatoes, and asparagus. The last recipe was an Asian inspired dish. 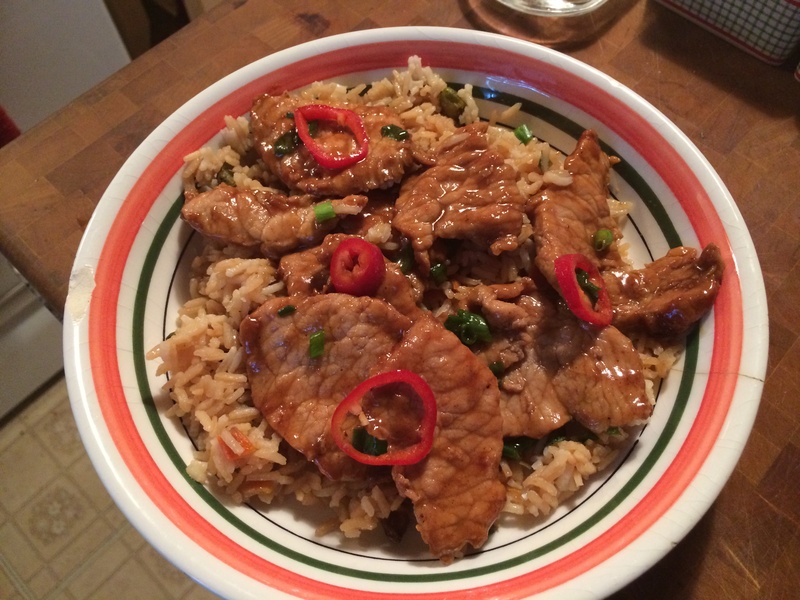 A pork stir-fry over rice. So basically, three weeknight meals using the same piece of pork but creating three totally different dishes. You never want to feel like you’re eating the same meal night after night.